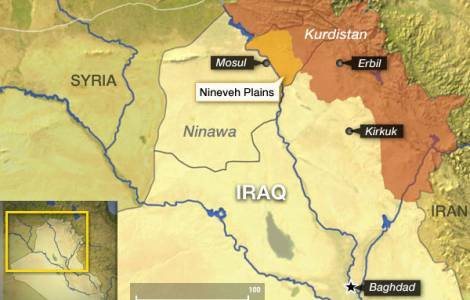 Erbil (Agenzia Fides) - 85 percent of the population who fled from the Nineveh Plain when that territory was conquered by the jihadists of the "Islamic State" (Daesh) is not yet ready to return to their region of origin, despite the area is no longer in the hands of jihadists. This is what, on Monday, January 28, Dindar Zebari, coordinator for international aid of the Government of the Autonomous Region of Iraqi Kurdistan, said. The representative of the regional government highlighted that some areas of the Plain, such as those of Telkaif and Hamdaniya, have become militarized areas in the hands of local militias. Among the reasons that make the return of Christians to Mosul and Nineveh Plain more and more uncertain is the fear that their families are not adequately protected from violence and retaliation, the lack of work, the disarticulation of infrastructure, the non-reassuring presence of autonomous armed formations, organized on a sectarian basis. "In many cases", added Zebari, "lands belonging to Christian or Yazidi owners have been confiscated to alter the demographic balance of the area".